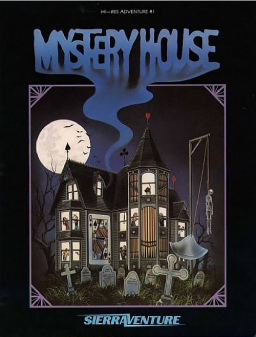 Mystery House is an adventure game released in 1980 by Roberta and Ken Williams for the Apple II. The game is remembered as one of the first adventure games to feature computer graphics and the first game produced by On-Line Systems, the company which would evolve into Sierra On-Line. Though the game is often considered the first to use graphics, role-playing video games had already been using graphics for several years at the time of release. 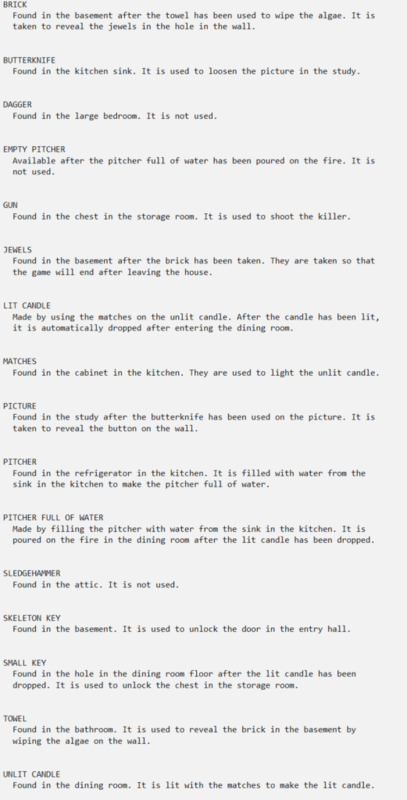 Applying graphics to an adventure game, however, was unprecedented as previous story-based adventure games were entirely text-based. Roberta Williams created Mystery House, the first graphical adventure game, a detective story inspired by Agatha Christie’s And Then There Were None. 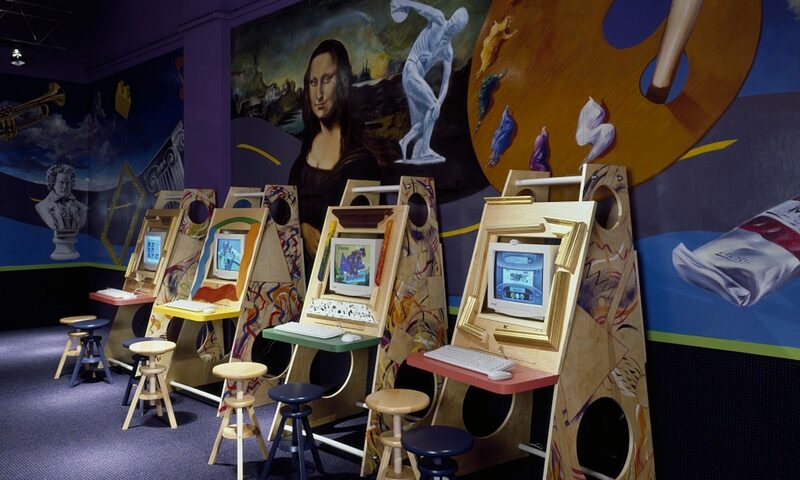 Her husband Ken spent a few nights developing the game on his Apple II using 70 simple two-dimensional drawings done by Roberta. The software was packaged in Ziploc bags containing a 5¼-inch disk and a photocopied paper describing the game and was sold in local software shops in Los Angeles County. To their great surprise, Mystery House was an enormous success, quickly becoming a best-seller. In 1980, the Williams founded On-Line Systems, which would become Sierra On-Line in 1982. The game starts near an abandoned Victorian mansion. The player is soon locked inside the house with no other option than to explore. The mansion contains many interesting rooms and seven other people: Tom, a plumber; Sam, a mechanic; Sally, a seamstress; Dr. Green, a surgeon; Joe, a gravedigger; Bill, a butcher; and Daisy, a cook. 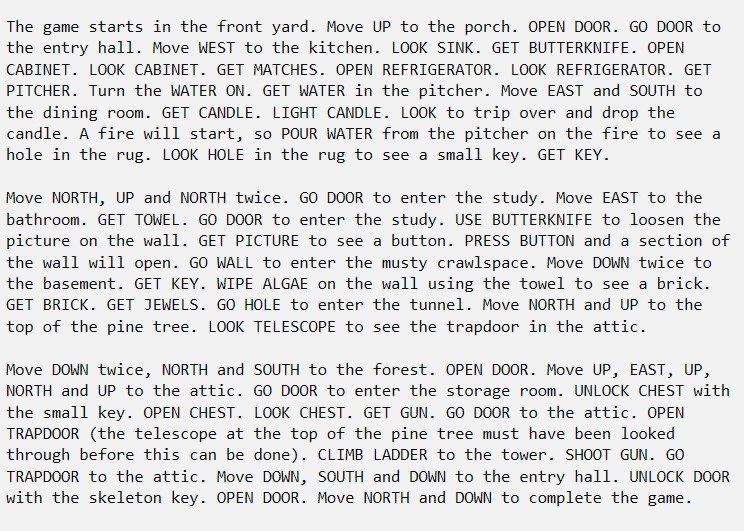 Initially, the player has to search the house in order to find a hidden cache of jewels. However, terrible events start happening and dead bodies (of the other people) begin appearing. It becomes obvious that there is a murderer on the loose in the house, and the player must discover who it is or become the next victim. The parser understands two words, the monochrome graphics are extremely basic and there is no sound to speak of. If you would like another walk-through, here is another example. Want to see someone play this? Go here. Maybe put on some music, the sound of the keyboard is depressing. 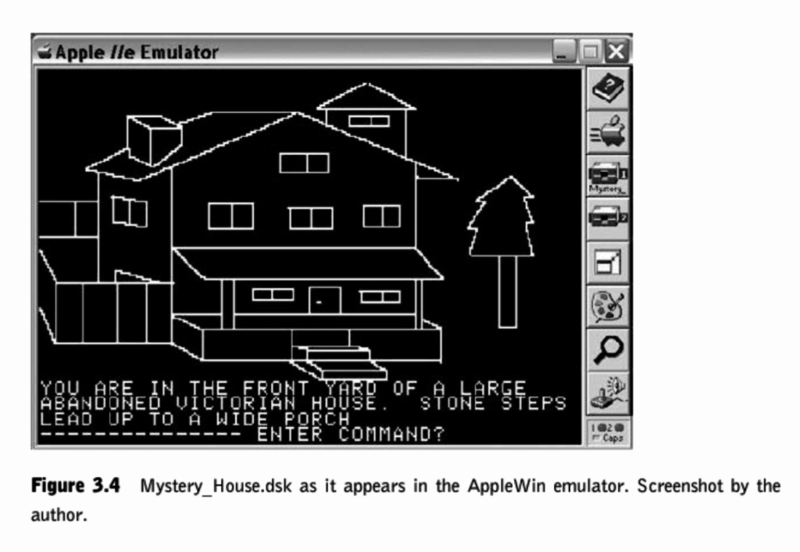 In chapter 3 of Mechanisms: New Media and the Forensic Imagination (2008), Matthew Kirschenbaum uses a disk image of the vintage interactive fiction game Mystery House to conduct a forensic walk-through, or multivalent reading, of an electronic object, a bitstream image of an original instance of 5 1/4-inch disk storage media. This exercise allows the reader to explore critical reading strategies that are tightly coupled to technical praxis, including the use of a hex editor to inspect heterogeneous information once deposited on the original storage media. It distinguishes between forensic and formal materiality more sharply into focus, using the overtly forensically charged spaces of the original game to peek and poke at the content of the disk image. Chapter 3 locates the “factive synechdoches” of bibliographical knowledge within new media, while exposing a new kind of media-specific reading, new tools for critical practice, and relevant contexts surrounding personal computing in the 1980s. Forensics is ultimately presented as a mode of difference or defamiliarization rather than an attempt to get closer to the soul of the machine (20). By walking through Mystery_House.dsk, by reading the disk image forensically, he conducts a media-specific analysis: a close reading of the text that is also sensitive to the minute particulars of its medium and the idiosyncratic production and reception histories of the work (129). Kirschenbaum successfully argues that formal materiality is the normative condition of working in a digital environment. 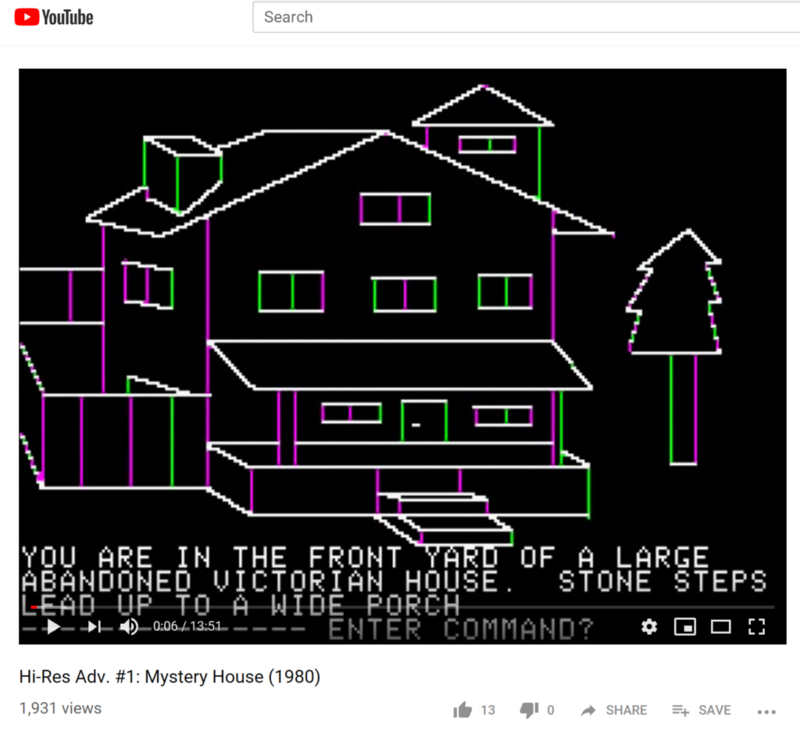 Mystery House emulators are textbook examples of formal materiality, relying on cascades of virtual machinery to reproduce the functionality of long-gone systems and hardware, the physical limitations of mothballed chips re-instantiated in formally construed mechanisms of control and constraints (155). Hi Laura, Thanks for the tutorial. The game seems sort of creepy but I see what Kirschenbaum is trying to argue. I’m just not sure how I would try and use this in my own work, or if that’s even the point? What benefit do you think this type of methodology can offer to traditional scholars working with digital humanities? Hi, Alex! I think the combination of us exploring the game and Kirschenbaum’s analysis allows us to gain a solid understanding of what digital material is. This exercise helps us go beyond this game’s (digital material’s in general) appearance on the screen and better understand what lies behind it. I think in the long run, looking beyond the surface of digital and non-digital sources in this way can improve our ability to examine the inner mechanisms, which could be crucial to our scholarly research, analysis, and conclusion. Hi Laura, I really enjoyed this read! In writing this, were you able to/ did you actually play the game? If so, what similarities did you find in regard to today’s graphics and videogames? Additionally, you mentioned that the graphics are extremely basic and that there is no sound in the game. Did you find out why no sound was added to the original game? Although Matthew Kirschenbaum’s “forensic walk-through, or multivalent reading, of an electronic object, a bitstream image of an original instance of 5 1/4-inch disk storage media through a disk image of the vintage interactive fiction game Mystery House” completely goes over my head…I find the complexities of graphics and videogames incredibly interesting as well as an ever-evolving subject! Thank you, Olivia! Yes, eventually! I would say you feel like you’re making choices, even though, of course, the variety of results are predetermined. It is not that no sound was added, it is that I suspect there just was no sound. I also found Kirschenbaum’s explanation written in a way that is time-consuming for the reader to follow his train of thought. Ultimately, I think he wants us to see and understand the digital appearance inside-out as not something intangible, but on the other hand, as something that can be traced. 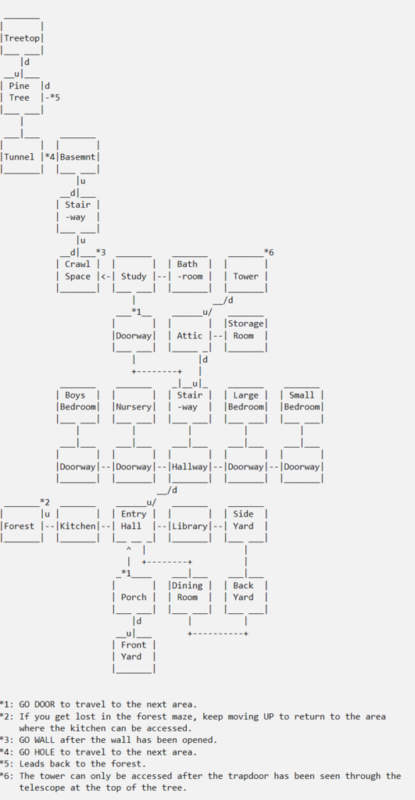 I actually thought about Bandersnatch when writing this! And what I think made Bandersnatch so appealing was the illusion of free will. The player/user feels more in control. Ultimately, though the Netflix original addresses more the Luddite-like fears that the society seems to express: does technology control us? And as with any resource, it depends on how one uses it.